The National Minimum Wage for workers aged 25 and over is rising by more than 4%, increasing from £7.20 an hour to £7.50. For those working full-time, the increase means a pay rise of nearly £600 a year to about £14,625 and will take effect from the 1st April. It will increase the wages of around two million workers. Shamefully, despite the massive surpluses amassed annually by housing associations, the sector still employs many on the National Minimum Wage (NMW) level, especially those in frontline services caring for the elderly and vulnerable. It also leaves 21 to 24-year-olds on the NMW only a 1.4% pay rise, and 18 to 20-year-olds will see their wages rise by less than 1%. For details of the NMW see here. Evidence seen by the Unite Housing Workers Branch has suggested that the 'G15', the 15 largest housing associations, has decided to peg average pay rises at a much lower level. Yet affordability is not an issue for these organisations. As a whole, the sector generated surpluses of £3bn in 2015/16 and continued to pay its CEOs inflation busting (and in some cases eye-watering) salaries. David Cowans of Places for People received £528,870, a rise of 9.8%, Jane Ashcroft of Anchor took home £400,010, a rise of 12.1%, and Elaine Bailey of Hyde Group enjoyed a 9.8% increase taking her salary to £251,478. 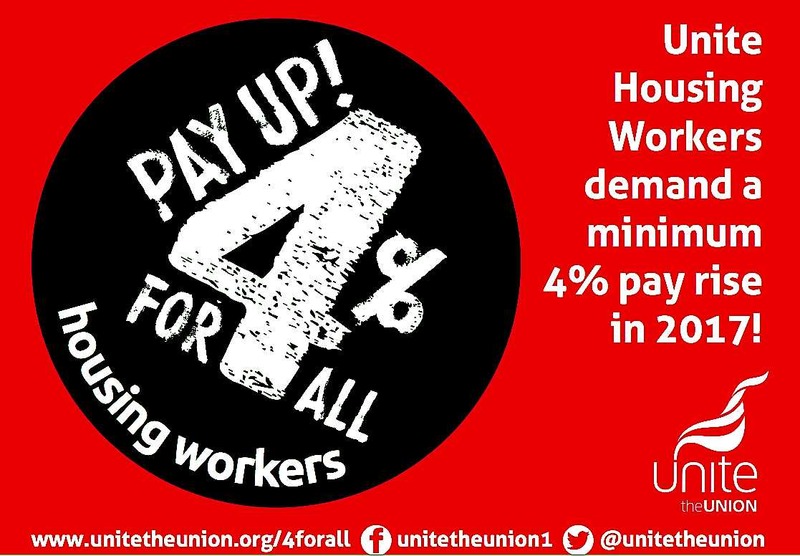 Unite has Unite has agreed to campaign for a minimum 4% pay increase in housing and reps have been getting a resounding message from workers that the increase is urgent. Resources to help reps submit their annual pay claims are available from Unite including draft pay surveys, posters, flyers and stickers are all available here. Over the last year, the cost of many essential items outstripped inflation, with double digit rises to fuel, car tax and insurance and housing. Housing charities and associations had the lowest overall pay awards in the last year with an average of just 1% compared to 2.5% in the private sector, meaning many have experienced real terms pay cuts. Housing workers are working harder and for longer hours and the pay no longer reflects how complex the work has become. If government has recognised that even the lowest paid workers need a boost of 4%, then it is time for housing associations to do the same for all their workers.